If you think Extract is going to be as hilarious and original as the genius gem of a film Office Space, you will be very disappointed. However, Extract offers a fantastic cast including Jason Bateman [Arrested Development], Mila Kunis [That 70s Show], Kristen Wiig [Whip It!] and everyone’s favorite straight man and character actor, J.K. Simmons. The basic premise is that Joel [Jason Bateman in standard uptight executive mode] is planning to sell his extract company until there’s a freak on-the-job-accident [naturally involving testicles] that looks like it just might put a huge kink in Joel’s plans. Soon a con-artist [a beguiling Mila Kunis] is cozying up to the guy who had the accident, threatening all of Joel’s master plans to get out of the extract business for good. A sub-plot is Joel’s sexual frustration with his wife [a cunningly amusing Kristen Wiig] and a male gigolo is thrown in for good measure. Ben Affleck [and so what if I’m biased because I think he’s a fine actor—see State of Play—and director and he’s from Cambridge, Mass. and married to Jennifer Garner who I adore] turns in some hysterical moments as Joel’s earthy bartender, druggy best friend [“Xanax just makes you feel good about everything.”]. 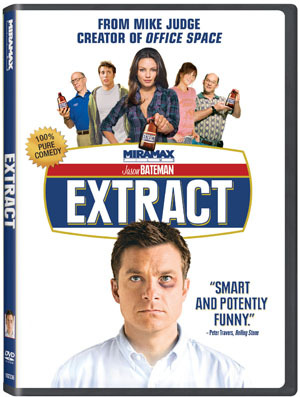 Extract will make you laugh and the performances by every actor and actress are on point. With lines such as “Are we still looking into replacing her with a robot?”, Extract is worth adding to your Netflix queue. This entry was posted on December 29, 2009, 00:20 and is filed under DVD. You can follow any responses to this entry through RSS 2.0. Both comments and pings are currently closed. Your blog caught my eye. Thanks for giving this information. I enjoyed this one, too – and I also think Ben Affleck is a good actor if given the right material. Loved State of Play! And did you see him in Hollywoodland? He totally disappeared into that role.